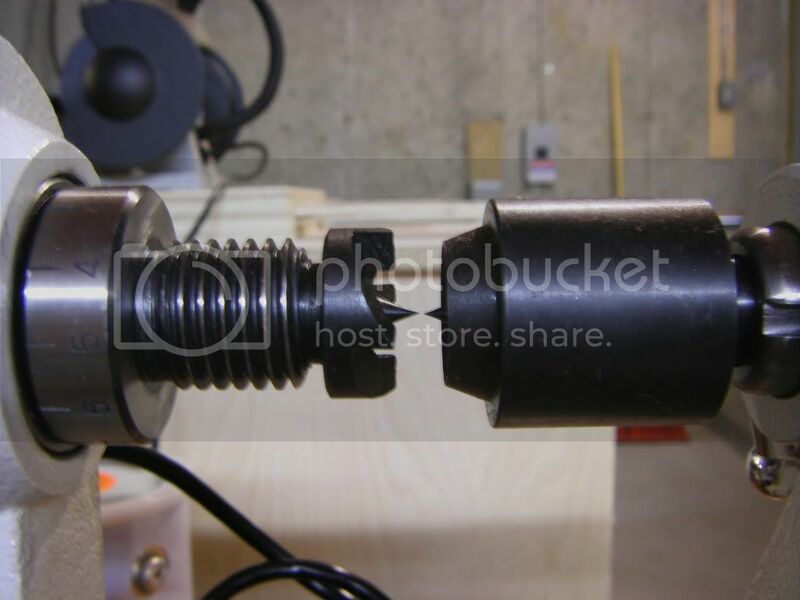 If you have looked at the bowl project I posted you know I am a complete turning neophyte AND you know I don’t actually own a lathe. Until now! I was at The Guild of New Hampshire Woodworkers’ annual meeting with a friend who suggested we make a trip to the neighborhood woodworking supply store. I thought it was a great idea because from where I live it’s an hour to either of the two stores (in the state, believe) that have cool stuff like lathes. He knows I have been looking to buy my first lathe; probably a mini. And he knows I have been looking on Craig’s List for the best deal. 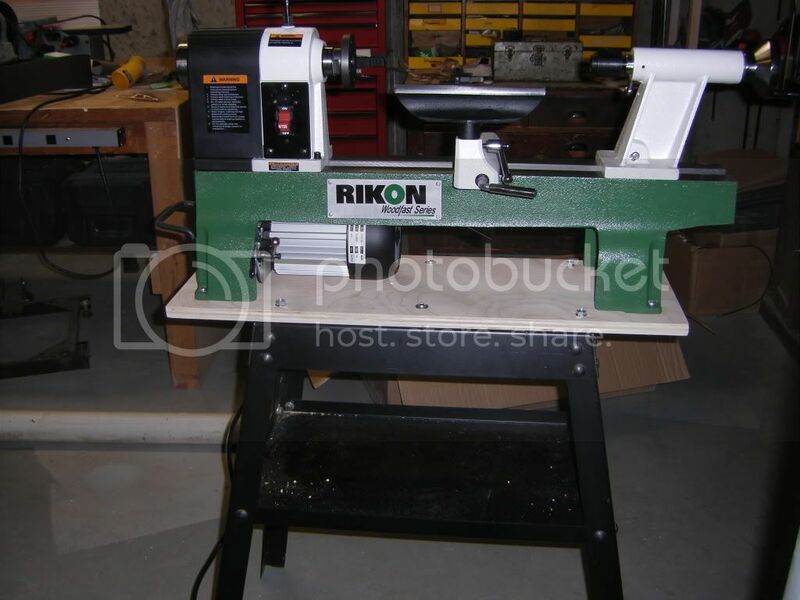 Turns out, talking to the salesman at “the neighborhood woodworking supply store”, that the Rikon 70-100 is on sale and close to the price I was considering for a used one. OK, the used one had some tools and “extras” but also has an unknown history and no warranty. You know where I’m going with this… I am now the proud owner of a new Rikon mini. I got it home last night and started pulling out and unwrapping and cleaning and screwing-on and … remembered if I wanted to post something on LJ I had better start taking pictures. So I unscrewed (no comments!) laid out and grumbled that this is really going to increase the box-to-turning time. Darn, the things we do for LJ. The packaging was well done; two big pieces of Styrofoam, some plastic bags for the small parts not already on the main piece and the box and strapping. The headstock, tailstock and motor were already on the bed. The 4” face place was screwed on the headstock. 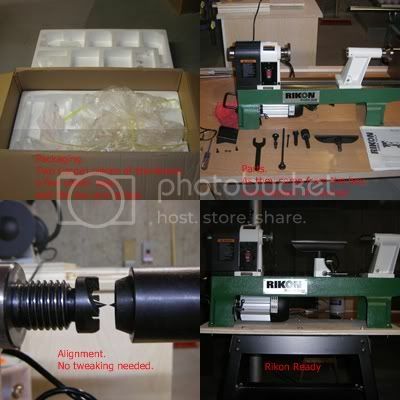 The other little parts were bagged and include live center, spur center, two knockout tools, spindle lock, tool tray, tool rest and wrench. All accounted for and cleaned. All the parts were oiled for shipping. I have everything out sitting on the table and I check the belt speed and set it low, plug it in and turn it on. Spins (as advertised) but I notice a lot of hum from the motor. Turns out the table is a greate sound board. The hum was minimal after mounted it on a stand. Next I installed the spur center and the live center and checked out the alignent of head to tail. It looked dead on to me. Got everthing together and cleaned and looked around to decide where I was going to put this thing. Then I spied the victim: my belt/disk sander. “I only use that occationally.” I redeployed the Delta stand. Had to add the plywood “plate” because the stand is a little small. The height would have been perfect if I didn’t have to use the plywood. As is, the turning centerline is about 1” too high (for me). If this setup works out I may have to nip the legs a little. :) The picture makes it look awkward sitting on the stand but its nice and stable. My only complaint so far is the plastic cover over the pullies buzzes sometimes. I think some electrical tape (black) around the perimeter of the cover might help. As I mentioned, I was worried about motor hum too but on the stand it is not an issue. Pretty quiet actually. Good review! Thanks for the post!!!!! 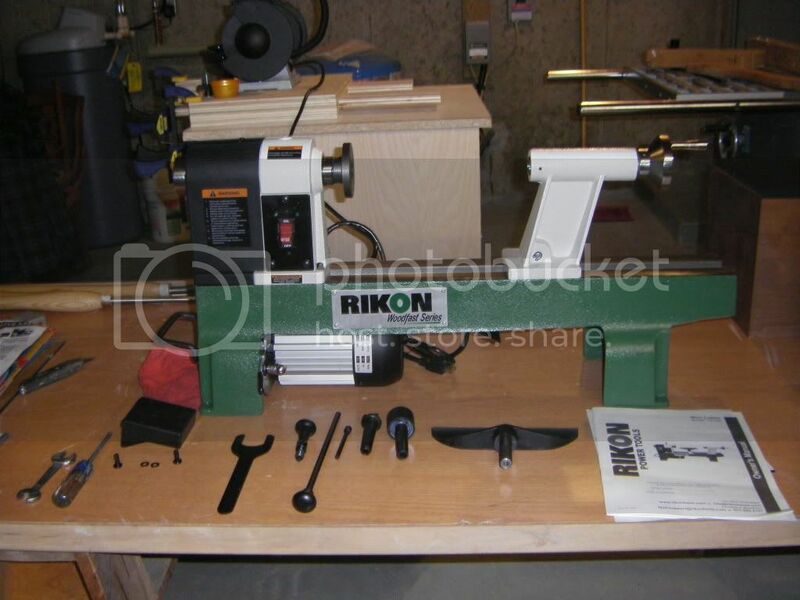 great review, i also have the same machine it is my small pen turning lathe and it is a great machine for the price. i also noticed the plastic cover vibrating so i put some duck tape around the ball and know it is alot better. my one suggestion is to get rid of the handle on the tail stock, it vibrats like crazy and will fall of one day if you don’t keep tighting it. have fun and be safe. I also noticed that the scale markings on the tailstock are completely unreadable without a strong light and looking at the right angle. I don’t imagine it is terribly important. I know I have 2.5” of travel. Roper, thanks for the tips. Seriously, you will really enjoy woodturning and getting your lathe broken in… I’ve been a professional woodturner for 14 years, so if I can help you please do not hesitate to contact me, or post a question. Take care and all the best to you and yours! My first turning was a laminated spindle for a lamp. It never got as far as the lamp stage. I managed to find a big crack in the stock and was very grateful for my face shield when it came off the lathe and bounced off of the shield. No blood but it did compress my nose a bit… So if you don’t have one yet, GET A FACE SHIELD! DBhost, I’ve been told get a face shield a couple of times since talking about turning. I have an old one but it’s time to update. The coax tape idea sounds good. I use 33+ black tape when I do electrical work. It’s great for that but not for sticking to plastic like we are tlking about. Thanks for the info. I have put some full size pics on Photobucket. If there is one I didn’t that you would like to see let me know. If there is a shot you want that isn’t there I’ll take it for you. Lets see if this works. Thanks for the big pictures…they came through great ! Well, nuts, you beat me to it. 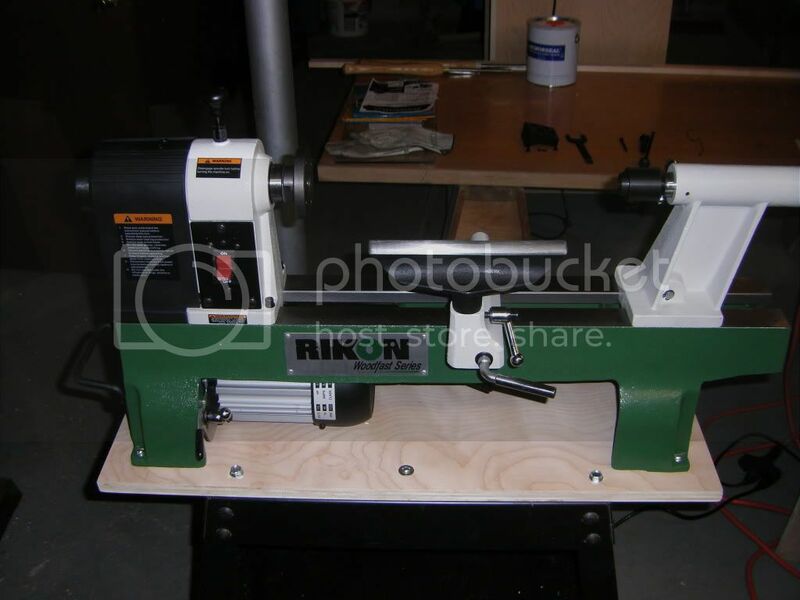 :-) I set up my new Rikon 70-100 lathe a couple of weeks ago. I’d planned to do a review of it but you did it so much better than I would have. I didn’t take any pictures. Had the same problem with the belt cover rattling, I just slap it and it quits. Compared to the Jet I think it’s way easier to change speeds. The pulley cover moves right out of the way so you can get your hands in there to move the belt Haven’t had a problem with the tail stock handle. I have had a bit of trouble getting the tool rest holder to snug down. Finally got it to where it works fine. The lower pulley on mine keeps working loose. Think I need some lock-tite for the set screw. It runs smooth. Mine isn’t even bolted down yet and it doesn’t move or vibrate at all. Turned a few pens so far with more projects for it in the pipeline. Great review. I agree it’s an incredible value. Dusty, The first house I owned was a duplex. Instead of bothering me the tenant decided to fix a door that was sticking. He chisled (probably kitchen knifed) the casing. 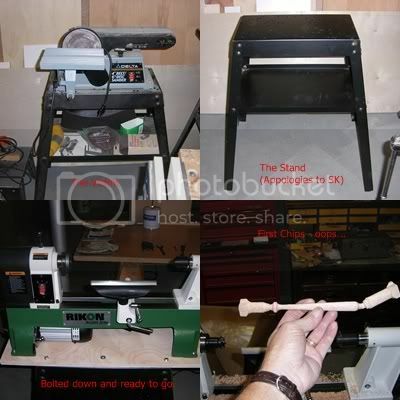 Darrell, Glad you like the lathe and the review. Last night I decided to put some tape on the cover. I used the 33+ electrical tape. It matches the black cover perfectly ;) The fix for me came when I taped the two long verticle edges where the cover sits against the head stock. My other passion is motorcycle riding. I have a Harley and as a good HD rider I also have blue Loctite. I used it on the stand bolts but I’m thinking I didn’t need to. I’ll keep it close by in case I have pully problems. Thanks for the heads up on the pully. Hey, thanks for the review, I’ve been wanting to know more about these lathes. If you want a good set of turning tools for not a whole lot, I did a review of the Benjamin’s Best 8 piece set (http://lumberjocks.com/reviews/712) that you can get from Penn State Industries. If you do get them though, I suggest finding someone with a Wolverine system for their bench grinder and learn to use it, you’ll need to touch the edges up a little.